8.53 points at 66 votes (rank 24). The game Elite has no defined aim and no defined ending. There is no time limit, in which certain tasks need to be done. This open game principle differs basically from all computer games known at this point of time. 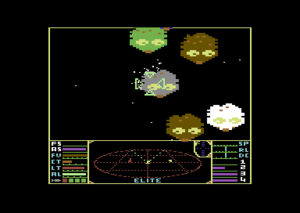 As Commander Jameson the player can travel through eight galaxies to boost his career as an astronaut. The success of the player becomes noticeable both in cash money and the grading as astronaut. Large and small mistakes have an influence on the criminal record, which in turn can result in a more hostile behaviour of the authorities or other astronauts. The player's spaceship needs to be navigated through three-dimensional space. The player can control the speed and the rotation around the crosshair and the vertical axis. Unlike Elite 1, the flying characteristics are like flying through the air (not a vacuum) – the maximum speed is reached quickly and a relatively narrow spiralling is possible. Furthermore, the gravitational force of the celestial bodies is missing - one has to steer around planets instead of swivelling into an orbit. The space traffic is handled by orbital stations; landing on a planet is not possible (for the player). Strangely, there is exactly one planet in each solar system with each exactly one orbital station. Docking to them can sometimes prove to be difficult. Interstellar distances are crossed by hyperspace jump of at most 7 light years. The beginning spaceship is equipped only very basically and the capital is very limited. Additional equipment can be bought which improves the fighting power and the possibilities to earn money significantly. Other spaceships cannot be bought. The possibilities to earn money are manifold. On the one hand you can trade by using the price differences between two solar systems. The prices of the traded goods are random to a small extent and mainly dependent on the economic classification of the corresponding system. With a space claw you can retrieve unowned items from space, which then can be sold. If the player does not want to wait until other spaceships jettison their shipping containers voluntarily, he can help them a bit by shooting the laser. This procedure is usually referred to as piracy. For shooting pirate ships and asteroids you usually get paid a small award, a bounty. Another source of income is the mining industry, which is the decomposing of asteroids with the mining laser. The parts can be collected and sold. A special peril pose the Thargoid Invaders. They can pull spaceships from their hyperspace jump and attack them in interstellar space. The octagonal ships of the Thargoids are astonishingly strong and robust. Furthermore, these spaceships send out remote-controlled drones that can be caught and sold. Sometimes these Thargoid ships also appear in space close to planets. If the account has reached 6583,5 Cr for the first time, the player can buy "Trumbels". This is actually not really a mission but it poses a task for the player. After 256 kills and in the first and second galaxy the player gets offered to search the stolen prototype of a fighting ship and destroy it. As a reward beckon 5000 Cr. After finishing the previous mission and 1280 kills and the third galaxy the player is offered to transport blueprints for a new fighting ship through half the galaxy. Here you are awaited by numerous fights with Thargoids as well as an improved energy unit as a reward. 3D-simulation in vector graphics; objects are displayed as lattice model (unique at that time on the C64). View in first-person perspective from the cockpit of a spaceship, information screens for the trading and navigation functions. Various sound effects and two music pieces. 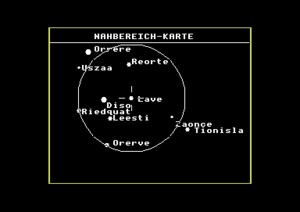 The functional position screen in the lower part of the screen shows the position of other objects relative to the own spaceship in Cartesian view. In the English version there is only one music piece (by Johann Strauß). In the German version, however, there is an additional song. When you have stopped the game with "Inst/Del", there are the following undocumented functions. X switch mode on/off: CTRL during hyperjump "attracts" Thargoids. In the BBC version each ship is counted as a kill. In the C64 version a "fractional" byte (a so-called kill evaluation) was inserted, which is given in the column "Kill Value" in the following table. Example: 8 destroyed platelet count as 1 kill (8 x 0,125). 4 destroyed Boas count as 10 kills. The possible enemies in a fight usually use the same tactics which are dependent on the ship type. Especially the smaller ships try to stay in the blind angle, here additional lasers can be helpful. If three or more ships materialise at the same time close to each other in the planet-near space, these are almost always pirates. Thargoids in the interstellar space always appear in groups of four, in planet-near space a group of two always materializes and always in a backmost quadrant of the positioning screen. The octagonal ships of the Thargoids are damaged by using an energy bomb, but they usually do not get destroyed, the drones are fortunately less robust. Missiles are useless, as the Thargoids have an ECM- system and they can release this almost immediately after locating the missile. If activated drones of the Thargoids are destroyed or caught with the help of the space claw, the corresponding (octagonal) spaceship releases new drones. If all main ships are destroyed, the remaining drones are automatically deactivated. The regular use of missiles or energy bombs is a very expensive affair, as the costs for a missile are disproportionate to a possible reward. Both can be seen as a kind of life insurance. If a missile is shot from a striking distance, the victim may not have enough time to release its potentially available ECM system, which sometimes also works for Thargoid motherships. The own ship can survive a collision with another spaceship or a missile hit, if the shields have their full capacity. So it can make sense to simply ram an especially persistent small enemy (e.g. Adder, Worm) , before it fires its missiles. The numerous sound effects offer a precious help during a fight. A laser hit makes a different sound as a misfired shot. The missile system can be used as targeting help. Once activated a short peeping sound rings when a target is in the sight; this is the right moment to use the laser. Laser and ECM system use energy from the accumulators. When the energy is scarce you should abstain from the use of these appliances, so that at least one energy accumulator can regenerate. Course changes at random and braking and accelerating manoeuvres can avoid hostile hits in the meantime. Trumbels are unfortunately not transparent. Trumbels are only looking for trouble! But they are soooo cute! Staying near the sun kills them but it wlll be difficult to get the invested 5000 Cr back by selling the furs. Using an emergency capsule is also no help here! The stolen prototype "Constrictor" (2nd mission) can be found in a certain system. Hints in the planet data lead to the trail. Fortunately, the new owners have no idea what is in the ship. The transport of the blueprints (3rd mission) will not get boring at all. Nobody ever gained wealth through mining. The most useful application of a mining laser is the working on the outer skin of a bigger freight ship, which after some shots releases its load and disintegrates into debris that can be retrieved and sold together with the freight containers. Dealing with drugs, fire weapons or slaves leads to the grade "offender" in the criminal records. If an emergency capsule is retrieved, it can be sold - together with the creature inside it - as "slaves". If an orbital station is "accidentally" shot, this leads to a grade as "fugitive", and the fanning out of police ships. 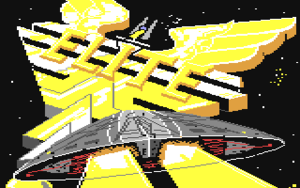 Here the player can only land again (if he can escape the police attacks), if the criminal record has been reduced (by a hyperspace jump) to "offender". The most trading profits can be reached, if you trade with systems that are as different as possible. You can reach good sales prices mainly with products that are rare in the corresponding system. Computer, machines and luxury goods sell in agrarian states significantly better than resources of all types, textiles or food. Gold, platinum and jewels can still be loaded although the cargo hold is already full. Captured drones of the Thargoids are attached at the outside of the ship and therefore do not add to the ships capacity. In the English version the first page of a two-sided information screen is always shown only for a few seconds , then immediately the second page is called up. This applies mainly to the system information and is therefore especially annoying, as the information about the economic system and the type of government are on the first page, the more meaningless additional information (made out of text modules) on the second page. In the German version this bug is fixed. and then fly towards it with fulll speed for about seven seconds, at the same time do not disregard the height indication. During this you can well look out to the rear and watch the stations getting smaller. Then you stop again, turn and head for the station, are aligned perfectly, only co-rotate and fly in. If it does not work the first time, just repeat. The docking computer can land automatically, but makes correction of the course until the ship is on the ideal inbound track. As the ship is only accelerated to half the speed, the docking with the computer can take incredibly long. The docking computer should in no case get switched on, if the station is not yet in sight, as the computer always chooses the direct path and does not consider whether other ships or the planet are in this path. The player flies towards the station, stops shortly before it and then heads towards the planet. Then you fly a few seconds with full speed towards the planet. Then the ship has to turn instantly at a halt. The ship should now be already on a more or less convenient inbound track. With full speed it keeps heading for the opening now and at the last moment before the collision the docking computer is switched on. Landing is most of the time a bit ungentle, but succeeds almost always. If the approaching angle was chosen really very unfavourable it can happen that the docking computer cannot make any sufficient corrections any more. A complete manual including the novel "Das Dunkle Rad" to the game in is availabe online on C64Games.de - Game No. 594 . Additionally, you find there star maps of all galaxies, solutions and background knowledge about the missions and the game. For a start you should transport food from Lave to Leesti. After having sold the food completely, you fill your storage room with computers and bring them to the space station of Diso. From Diso you then fly again with food and later also with fissible material, spirits or furs back to Leesti to start from there again with computers (alternatively, but less profitable also machines and luxury goods). On the route Leesti - Diso there is often smuggling of drugs/weapons and slaves, however, many a smuggler was ruined because the sales prices are sometimes drastically below the purchase prices. Others were caught by the police or the competition. The route Leesti-Lave works similar to the route Leesti-Dori, but yields a lower profit. The route Leesti-Riedquad is also comparable, but you should not fly to Riedquad without the protection of beam lasers (best front and back). Basically, concerning the percentage, food, spirits and textiles are best traded from poor to rich and in absolute numbers per ton, furs, spirits and fissible material. In the opposite direction from rich to poor, computers are always the first choice next to luxury goods, weapons and machines. Attract Thargoids in hyperspace with CTRL , then unhurried mining. Sledgie: "Elite is a very good combination of a 3D space shooter and an economic simulation. The controls in the game are a bit difficult for a beginner. Especially the annoying landing without computer is not easy. Very good conversion of the game on the C64 and overall an ingenious idea for a game. " Guybrush: "Concerning the game principle Elite was way ahead of the times!! I myself have not really played it enough to be able to evaluate it." Darkstar: "When I played the game for the first time, it was somehow too complicated and boring for me. I think I was about 11, did not understand much of the 3-dimensional navigation (this came only with X-Wing on the PC ;-) and therefore was shot all the time or I crashed somewhere. Therefore only 6 points from me." Anonymous author: "One of the best C64 games at all. 3D vector graphics, unlimited room (this is done by almost nobody, even today), always something going on. It was really fun to play. Good and not normal for a long time yet was also the save function, which made “annulling” of the game status possible. A disadvantage were some hardly to solve battles, if again 6 ships come together and they take full 15 seconds time to destroy the all-around military-laser protected ship in seconds, only because you have already used up the bomb. After 1500 kills you start to search for "new things", but the fun in the game compensates for this." Spacekowski:"Flying aimlessly through space, trading, fighting and pimping the spaceship. The game belongs to the coolest games of the C64 era. At at that time I had opened my box and rewired the function of the keys to two small boxes on my desk chair. With this I had the controls over the missiles, the shields etc. directly at the chair. That was so wicked! Try that today. " 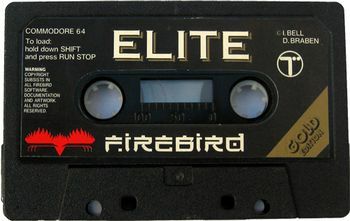 Equinoxe: "Elite was THE C64 game for me for a long time. Except for various role play games there is no game into which I invested more time than this. I competed with a friend about who will rise a stage higher first. And on the schoolyard the most recent tips and tricks were swapped, Annoyingly he made it a few days before me to be Elite. In the meantime I was in such an Elite-delusion that I imagined while playing that my room was the spaceship and I really was a captain of a spaceship (which worked well with the sight into the starry sky through the dormer). It was a really great time then. Definitely 10 out of 10 points." 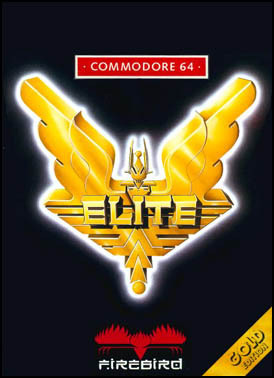 The game was awarded the British Golden Joystick Award in the category Best Original Game of the Year in 1984. The award referred to the BBC Micro and Acorn Electronic version which had been released a year earlier. 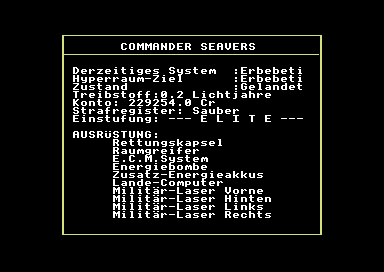 In Elite an own pseudo random generator is used with a six bytes seed. The programmers of the Archmides version "ArcElit" (which were not Bell/Braben) specially integrated a rudimentary 6502 emulator so that on the ARM the same galaxies could be generated as on the BBC B and C64. The starting sequence resembles the starting sequence of a "Viper"- fighter ship in the TV series "Battlestar Galactica". 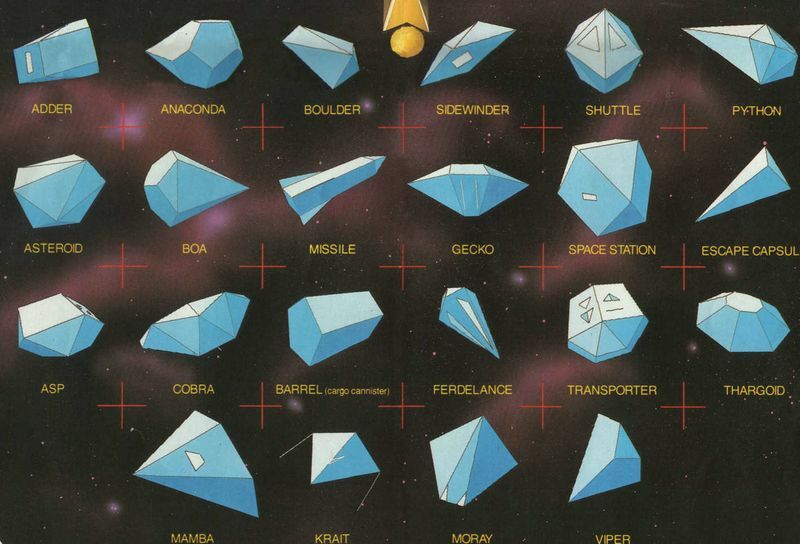 It can be coincidence that the police spaceships in the game are also named "Viper" as almost all spaceship types carry names of snake species. The docking sequence follows the model of a similar scene in the movie "2001: A Space Odyssey"; a rectangular docking opening of a space station is also shown there. In the movie it is accompanied with "The Blue Danube" (Danube waltz) by Johann Strauss II (son). In the game the same melody is played when the docking computer is in operation. The "Trumbel" animal reminds one strongly of the "Tribbles" from two episodes of the TV series "Star Trek". The "Tribbles" also became a plague due to their unbelievable reproduction rate. In the manual the commander of a "Python"- spaceship named "Monty" is mentioned. Also the company "Whatt & Prittney" (instead of "Pratt & Whitney") is mentioned in the manual as manufacturer of gears. In the English Version the trading good platinum is not named platinum but latinum (but not pressed with gold!). If especially many enemies were destroyed within a short time, the praising comment "Right on Commander!" appears. The name Jameson goes back to the Whisky brand with the same name, as David Braben revealed in 2012. Jameson wasn't all that important at the start, but has become so as he has become part of the Elite lore. The initial reason was I wanted a 7 letter commander name that would work as a filename on both the BBC micro and Acorn Atom. Ian and I discussed a few possible names. I liked Jameson as it is one of the best blended whiskys! Plus/4: Two versions were made independently from each other and without commercial background. The earlier version is by Pigmysoft from 1988, the later one is from 1994 by Csory 1994 (they are both developers from Hungary). 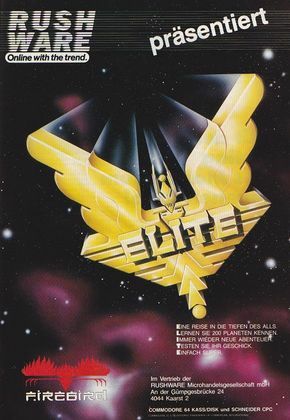 Links to C64Games forum entry "Highscore Elite"
This page has been accessed 33,808 times.